Recently, Fast Company, Dezeen Magazine and Wired have featured articles about UNStudio’s design for the Nippon Moon, a Giant Observation Wheel (GOW) to be located in Japan that could rival the London Eye and Singapore Flyer. To make the Nippon Moon unique, UNStudio teamed up with Experientia to create a journey that takes the customer into the heart of the view, and helps to bring the landscape to life in an immersive, innovative experience. UNStudio invited Experientia to develop the interactive aspects of the project, while engineers Arup and Mitsubishi Heavy Industries are collaborating on the technical specifications. From a distance, UNStudio’s concept may look similar to the well-known observation wheels of London and Singapore. As UNStudio notes, the wheel’s look is governed by structural constraints (defined by Arup and Mitsubishi Heavy Industries — two of the world’s most specialised wheel engineers), as well as by the location and the size of the wheel. But closer up, the concept is highly innovative, creating a complete user experience where the journey is much more enduring than the 40-minute rotation on the wheel itself. Architecturally speaking, there are several innovations which make the Nippon Moon stand out. Although the size and location are currently undisclosed publically, UNStudio confirms that it will be nearly twice the scale of the London Eye. It also features double-decker capsules – a world first. But it is the focus on user experience aspects that make the wheel concept truly unique. Experientia researched the various experiences of the customer journey from “Discovery” and “Ride” to “Return”, and designed various touchpoints and applications. The discovery moment starts as people begin to find out information about the wheel and purchase tickets online. With the Nippon Moon app, interactive features allow people to choose the time of their ride and their capsule, each of which has a unique internal theme. The app also builds excitement over the interim, sharing views from the top of the wheel and counting down to when customers start their rides. On the day of the ride, people can use the app to keep track of how long until it is their turn to board, allowing them to move within the facility freely, and avoiding queues. Once on board, the experience of looking out at a city landscape is transformed by augmented reality techniques, built into the transparent skin of the capsules. Imagine looking out at a city skyscraper, for example, and being able to see how tall it is compared to towers around the world, or compared to Godzilla. The augmented reality offers viewers the option to immerse themselves in the historical and cultural relevance of the landscape they are looking at – or they can choose to simply enjoy the unenhanced view. Experiences are shared however, and the app also allows riders to interact with each other. The Nippon Moon app lets people communicate the other capsules during the ride, or to send their own photos to the Hall of Fame, where they will see them displayed in a dynamic digital photo installation as they leave the facility. 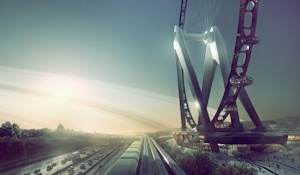 With original concepts and high-tech implementation, a ride on the wheel will become a truly unforgettable experience.